Cancun may be famous for spring break, but there is so much more to this idyllic destination than a party scene­—and what better place for the most important party you’ll ever attend—your wedding! Sandy beaches and scenic views provide a beautiful backdrop for couples looking for the perfect place to tie the knot… and revel in relaxation afterward. If Cancun calls to you, then Enchanted Honeymoons is the first call you should make. Our Omaha travel agents are experts in planning the perfect destination wedding. We work with the best resorts in each of our destinations and are ready to help you plan every moment of your wedding celebration, right down to the return flight. Whether you and your love are dreaming of a classic wedding, a contemporary ceremony, or a one-of-a-kind experience, Cancun offers you plenty of options for your big day. From ancient Mayan archaeology to modern resorts, Cancun is the perfect blend of old world elegance and cosmopolitan excitement. Best of all, a wide variety of luxurious resorts offer wedding packages to accommodate your every wish for your wedding. These resorts embody the worry-free Caribbean attitude by taking care of every detail for you. Since everything is included at these locations, you and your guests won’t be expected to pay for food or drink anywhere on hotel property. Having everything taken care of before you arrive allows you to truly unwind and revel in the exquisite experiences offered at these resorts, be it fine dining, live performances, or exciting excursions. Some weddings just aren’t right without a whole host of friends and family there to celebrate. If that sounds like your dream ceremony, you’ll definitely want to choose a family-friendly resort. These hotels cater to guests of all ages. Many family-friendly hotels offer deals for large groups or wedding parties, which means that you and your guests can enjoy paradise at the perfect price. For a mature ceremony and stay, you might like an adults-only resort. These accommodations are classy and intimate, providing you and your new spouse with the perfect opportunity to relax without noisy neighbor children. Often home to upscale eateries and impressive on-site entertainment, adult-only hotels offer the perfect place for newlyweds celebrating. There’s a reason that “long walks on the beach” are a cliché: nothing is more romantic than a picturesque stretch of sand and sea. Cancun offers gorgeous indoor ceremony venues, but a beach wedding truly embraces the idea of a tropical destination wedding. The resorts we work with have access to the most spectacular beach wedding venues, and many will offer discounted (or even free!) beach wedding packages for newlyweds staying in their hotels. An Enchanted Honeymoons travel agent can help you determine which Cancun hotel and venue package is best for your big day. We all know the actual wedding is the main attraction of your Cancun trip, but that doesn’t mean the days surrounding your new anniversary should be anything less than legendary. Fortunately, Cancun was developed with travelers in mind. 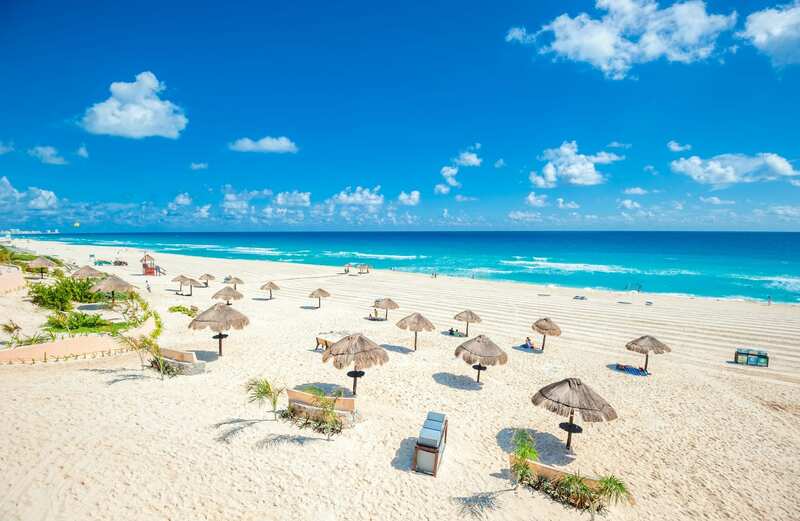 From the oceanfront activities to upscale shopping and incredible nightclubs, Cancun truly has something for everyone. It should come as no surprise that the nightlife in Cancun is some of the best you’ll find anywhere. What you may not know is that there’s more to Cancun than dive bars for spring breakers. From the famed Senor Frog’s to ultra-exclusive clubs like Mandala and Shah, you’ll never be at a loss for a place to let your hair down. If you simply won’t leave paradise until you’ve experienced the beauty of the ocean, then Cancun has the perfect offshore activities. Between snorkeling, scuba diving, sailing, and dinner cruises, there’s no shortage of ways to get out on the water and create exhilarating memories. For golfers, Cancun is a dream location. Enjoy the picturesque scenery while you play courses that have been designed by some of the game’s greats. The Iberostar Golf Club Cancun is an exceptional course, rolling through Mayan ruins and setting up an enjoyable game for golfers of all skill levels. Many resorts have dedicated golf courses and packages, but even if yours doesn’t, there are plenty of places to play! Xcaret, an ecological park near Cancun, is the perfect opportunity to immerse yourself in this tropical wonderland. Beautiful plants and exotic animals await you, as well as snorkeling and the opportunity to swim in a natural underground spring! There’s even a show in the evening, which you definitely won’t want to miss. The perfect excursion to do with the whole family or just as a couple, swimming with dolphins is an iconic experience. This activity is perfect for those seeking a remarkable and memorable adventure. You certainly won’t regret taking a dip with a dolphin! Whether you’re after upscale boutiques or vibrant flea markets, you’ll definitely want to do some shopping while in Cancun. Mercado 28 is an amazing place to pick up souvenirs and soak up some culture. After a day of retail therapy, relax at one of Cancun’s many spas for a day of uninterrupted luxury. Mexico is awash in a rich cultural history, beginning with the Mayans. Ruins of their temples and evidence of their fascinating civilization are a must-see for more studious newlyweds. Explore Chichen Itza, the ancient Mayan capital, with a guided tour or even a private archaeologist! Some all-inclusive resorts will have deals on tickets to these excursions, so be sure to ask at your hotel. If you’re ready to commit to Cancun, or just looking for more information on what the area has to offer, call Enchanted Honeymoons at 402-281-3022. Any of our expert Omaha travel agents will be ready to assist you in planning the best trip of your life!